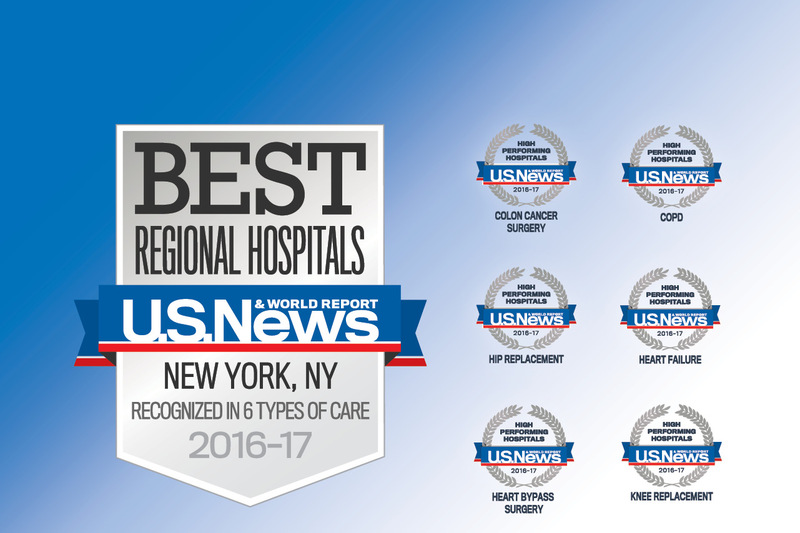 August 2, 2016 – In its 27th annual “Best Hospitals” rankings, U.S. News & World Report named Englewood Hospital and Medical Center a Best Regional Hospital, ranking the medical center #7 out of 95 hospitals in New Jersey and #16 out of 169 hospitals in the New York metropolitan area. In addition to its state and regional recognition, Englewood Hospital was ranked as “high performing” in six procedures/conditions: heart bypass surgery, heart failure, colon cancer surgery, chronic obstructive pulmonary disease, hip replacement, and knee replacement. The rankings, released today, are designed to help patients make more informed decisions regarding their health. The 2016-2017 rankings evaluated nearly 5,000 hospitals nationwide using objective measures such as patient survival, the number of times a given procedure is performed, infection rates, adequacy of nurse staffing and more, and, to a smaller extent, a survey of physicians.